I think I was born singing. My older brother, Peter, remembers that as a small child, I would wake up early in the morning every day and immediately start singing. It drove him crazy! I have had no formal music training, but have enjoyed singing as a way of expressing myself since early childhood. I taught myself to play guitar at age fourteen. Summers were always spent on Georgian Bay near the village of Pointe au Baril, Ontario where my parents owned an island and built a cottage in 1960. One of my summer friends taught me my first few guitar chords. Summers on Georgian Bay remain a constant in my family’s life, providing peace and spiritual renewal as needed. One of my biggest influences in music was Gordon Lightfoot. I learned to accompany myself on guitar and sing most of his early songs. I loved to perform among friends whenever I had the chance. My wife Margaret remembers us camping at Killbear Provincial Park just north of Parry Sound about 35 years ago. Among other things, I sang Lightfoot’s “Canadian Railroad Trilogy” at a campfire on the beach one evening, and the next day, we ran into one of my past University Professors who was camping elsewhere in the park. 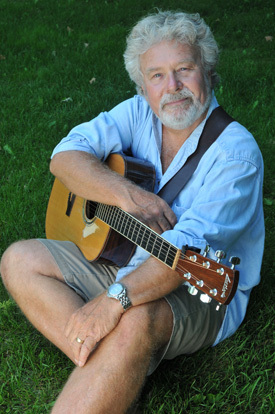 He told us he had heard the singing coming from the beach the night before, and had said to his wife, “That’s either Gordon Lightfoot singing … or Reid Wilson.” Folk legends Peter, Paul and Mary, and John Denver, also greatly influenced my style of singing and playing. One highlight of the 1960’s for me was performing at a small club on Toronto’s Yorkville Avenue called “The Mousehole”, just down the street from the famous “Riverboat”. I met Margaret in 1976 and we married on August 6, 1977. Our son, Jason, was born in February 1979. So, for the next 13 years or so, my life revolved around my profession as an Ontario Land Surveyor, and my family. The guitar only came out a few times a year, mainly at the family cottage where our local islander friends got together to have a “hootenanny” once or twice every summer. This wonderful music tradition at our cottage continues to this day. In recent years, we are thrilled to have our son Jason (and other third generation islanders) also participating in the singing and playing of guitars. When we moved to Uxbridge, Ontario, in March 1992, I quickly became involved a community-based variety show called “uxperience”. I was at a crossroads in my professional career which allowed me the freedom to put music back into the mainstream of my life. I participated in the making of a video to accompany the winning song for “Celebrate Durham ’94″ (the 20th anniversary of the Region of Durham). Through performing with “uxperience”, I met Judy Seymour and George Pratt; and the three of us formed a trio Faded Denim in 1994 singing in the style of Peter, Paul and Mary. Terry Paul soon joined us as our bass player. In 1996, I was a founding member of Scottish balladeers Claidhmor along with Stewart Bennett, Fred Cotie and Ryan Edgar. Although I left this group in 2000, Claidhmor has continued to perform with the addition of new members. In August 1999, I was also a founding member of FullCircle with Don and Barb Cavin, and Norah Love. This foursome combined to create a harmonious blend of voices, instruments and original arrangements to a variety of songs. Bass player Doug Hutchinson joined this group in 2001. We produced and arranged a professionally engineered CD in 2002 called “No Straight Lines” at Studio 92 in Toronto, which covered seventeen songs in a variety of styles and genres. (See http://www.jboyweb.com/fullcircle/ ) After the Cavins left the group, we formed a new configuration of FullCircle in 2004 which included John and Anna Ioannou. 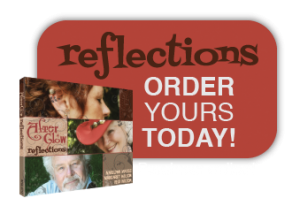 While still rehearsing and performing with the new FullCircle, I also enjoyed the forming of a new musical collaboration with friend and former Sweet Adeline, Marilynn Massie … we were a duet known as AfterGlow. My wife, Margaret, joined us in 2008 to form the current trio of AfterGlow. I have also enjoyed being a member of Uxbridge Musical Theatre (UMT) for several years. My acting debut in January 1997 was as Dr. Neville Craven in the musical version of “The Secret Garden”. Then, in October 2000, I dyed my hair and beard black for the role of El Gallo in “The Fantasticks”. The part called for a tall, dark, slim, handsome and swarthy swashbuckling sort of fellow… so, naturally, they picked me!! In January 2001, I played Marcellus Washburn in “The Music Man”. All were memorable experiences of acting, singing and even dancing… at the Music Hall in Uxbridge. Margaret and I now travel to Florida for the winter months. We no longer enjoy the cold and snow of Canada, opting for warmth and sunshine instead, living in our comfortable fifth-wheel trailer at a lovely resort just north of Tampa. We bring along all of our own sound equipment and musical instruments, and we take great pleasure in hosting a weekly “Happy Hour Jam Session” every Friday evening at our resort. 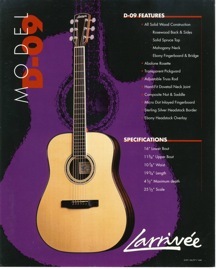 Reid’s Guitar is a Larrivee D-09 made on March 14, 1996.